As a wet autumn passes over us, Three Cornered Copse has become an area fit only for the most ardent mudlover. The paths, usually baked hard in the dry season, are now fit only for the sure-footed, wellington wearer, with a good sense of balance. It's the same story each year; only a fortnight of rain is needed to turn the paths into a quagmire. Each year The Friends of Three Cornered Copse take a truckload of woodchips, courtesy of the council's Stanmer Gardens nursery, and distribute these along the worst affected routes. This particularly affects the paths at the top of the copse running between the woodland and along the wire fence bordering Woodland Court flats. A natural dish traps the water, which refuses to drain away, resulting in the mud paths. The woodchips tend to last for six months or so, until the spring returns, providing some surface to the less slippery areas. This year the council has decided to take some "flood mitigation action", and has delivered several tons of chalk in grab-bags on the side of Dyke Road Avenue. The chalk will be used to create a more drained surface in these paths, hopefully rendering them less treacherous to walkers and cyclists. The exact nature and plans for this chalk has yet to be disclosed, more on this in later months. According to the Campaign for the Protection of Rural England, litter and fly-tipping bother us more than almost any other issue. A Mori poll in July 2007 found the public more concerned about litter and graffiti than they were about climate change. MPs get more letters complaining about litter and dog fouling than anything else, and these are regularly tackled by the Friend s of Three Cornered Copse on each workday. 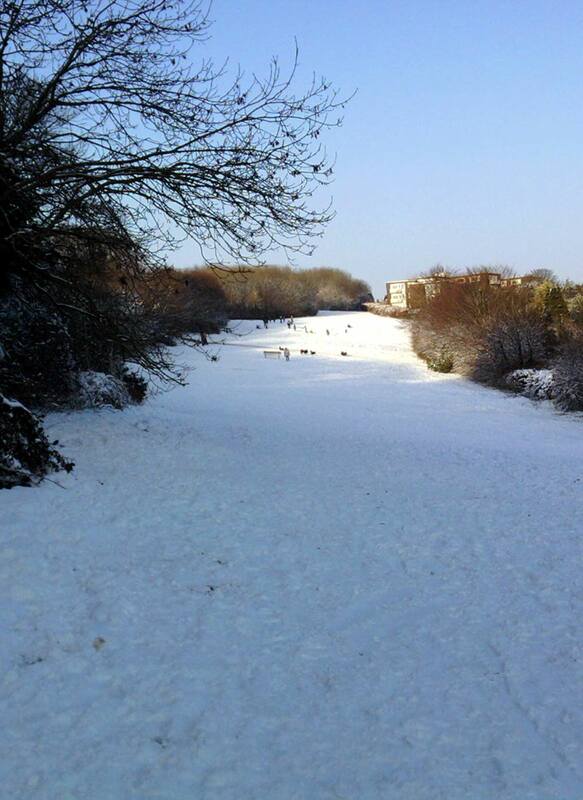 Most of us prefer the traditional winter scene of the copse, covered in snow for sledges and snowmen. This photo was taken in 2010. Happy Christmas, from the Friends of Three Cornered Copse.